Office 365 offers apps and services that let you manage content to suit the way you work. Past video options have included everything from SharePoint Asset libraries to Office 365 Videos, providing basic features like video thumbnails. 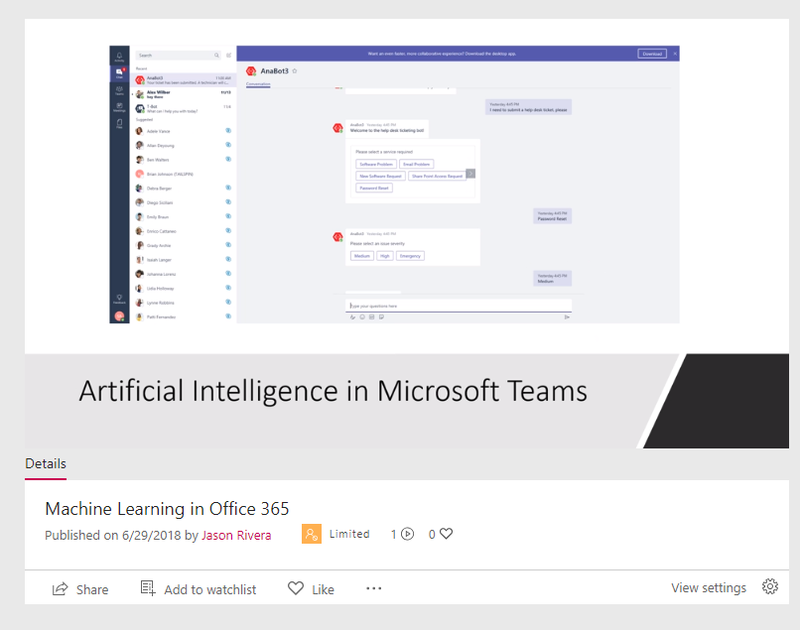 But recently, Microsoft introduced Microsoft Stream, a powerful, modern video management app with AI functionality that enhances the user experience with facial detection, transcripts, text search, and more. The Stream homepage features information on how to use Stream, along with a slider of content that includes videos trending in your organization. From here, users may create channels, groups, and upload videos. Channels let users categorize videos, while Groups enables control of video access. Uploading content to Stream is simple. Upload buttons appear prominently throughout the site. For example, in the screenshot below, I navigated to a Group that doesn’t contain any content. Stream processes each file several times to extract thumbnails and text. So, uploading files can take some time, depending on how large the file is. Users specify a video title and description, select a thumbnail image, and set the video permissions. Additional options include facial detection, enable comments, and add video captions. Once published, users may return to the image-upload location where they’ll see a modern video content site. Now that your media content is uploaded, your users can begin to use some unique and rich AI-driven features. At first glance, videos appear to be embedded in a typical player, with title and description, plus the ability to share, like, and add to a watch list. But Stream takes enterprise media to the next level by infusing artificial intelligence into the mix to improve the way we consume video content. Search via facial detection is an interesting new product feature. Stream scans videos and detects the faces that appear in them. A timeline is created for each detected face and a mark on the timeline indicates when each person appears in the video. Clicking the timeline takes the user to that moment in the video. Additionally, text analysis is used to transcribe videos. A full transcript appears to the right of each video, including the time a sentence was said. As with facial recognition, clicking a sentence takes the user to that moment in the video. The transcript also includes search capabilities. This feature is very useful, especially for longer videos. Say you want to search a recorded staff meeting. You remember something that was said, but can’t remember when it was said. Instead of clicking through the video until you find the quotation you’re interested in, simply type a few words and let Stream take you right to that moment. Similarly, Stream offers closed captioning (CC) for accessibility. Microsoft products do a very good job of just working together. If you want to post a featured video to a SharePoint site, for example, simply embed a Stream web part in the page that points to the video. Note: videos embedded this way don’t include facial detection and transcripts. PowerPoint also allows you to export a presentation to Stream. This export uploads the presentation to Stream and makes it playable. Alternately, if Teams is your tool of choice, you can also create a Stream tab and embed your video there. 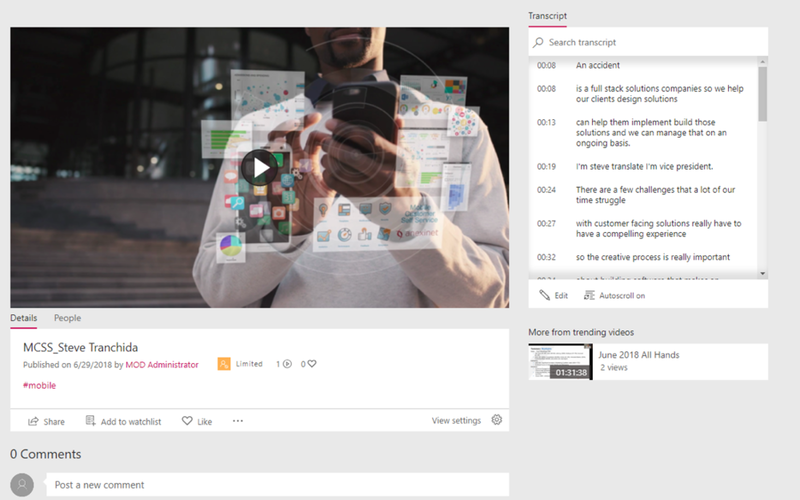 Microsoft Stream is an enterprise video hub with artificial intelligence (AI) features designed to help you find content quickly and efficiently. The interface is rich and modern, giving users a responsive experience on par with popular modern video sites. Its integration with other Microsoft products lets you consume and distribute content easily with tools that you are already familiar with. For more information on Microsoft Stream and to learn more ways to consume and distribute content throughout your organization, please don’t hesitate to contact us. We’d love to help you out.